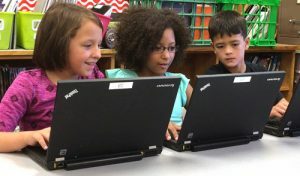 Standing at the intersection of digital citizenship and responsible device usage, school districts can make a real difference in their students’ lives. We’re committed to helping our students use technology safely and responsibly, so our district implemented a Responsible Technology Use agreement. For our students, this means completing an annual digital-citizenship course within 30 days of enrollment in the district. Our digital citizenship courses teach our junior high and high school students how to respect themselves and others through digital etiquette, digital access, and digital-law lessons. The courses educate students and show them how to connect with others through digital literacy, digital communication, and digital commerce lessons. Step 4: Find a student safety screening tool to support your safety measures. We used to rely on student reporting of suspicious or inappropriate online activity. Before becoming a Google district, we worked with Amplified IT to complete a Google audit, which ferreted out the number of profane words residing in our students’ Google Docs. We were filtering at a high level, but not going far enough to catch students using profanity or specific catchphrases tied to bullying, inappropriate behaviors, school violence, and other harmful situations. To help, we searched for an online platform that would close that gap while also monitoring student email for inappropriate discussions. Step 5: Look for what isn’t visible – Stranger Danger and more. We recently intervened when an underage foster child began communicating with an adult male who was planning to pick her up and run away. During one email exchange, the adult happened to include profanity, and our safety-management platform picked up on it and alerted us to the potential problem. That, in turn, opened up the entire email conversation and allowed our district administrators and the child’s foster parents to intervene in what could have turned into a major incident. Step 6: Know that you can’t put a price on a student’s life or future. ou also can’t put a price on the value of educating a student to be a good digital citizen. However, the investment we’ve made in both time and money to achieve our goals in this area have been well worth it. The information for this post was taken from an article my Dr. Audrey Hovannesian in eSchool News, follow this link for the complete article and more details.